Diversified investment strategy and disciplined investment process capitalizing on Africa’s consumer demand driven growth and increased regional integration. Mkoba, a generalist private equity fund, target investments in strategically identified sectors and countries mainly through acquiring influential minority stakes in high growth SMEs with ability to influence trajectory. For all its investments Mkoba will apply well-defined investment criteria and follow a disciplined investment process, integrating value creation, ESG and development impact assessment at every stage. Strategic country selection criteria with niche countries, gaining early mover advantage by leveraging Mkoba’s deep local networks and knowledge. Mkoba employs a particular focus on fast growing countries undergoing liberalization and post-conflict countries rebuilding their economies. Mkoba believes that these countries constitute an often overlooked investment opportunity. Mkoba’s target countries are experiencing strong growth driven by high domestic consumer demand, reform-oriented governments, and a fast growing domestic private sector. 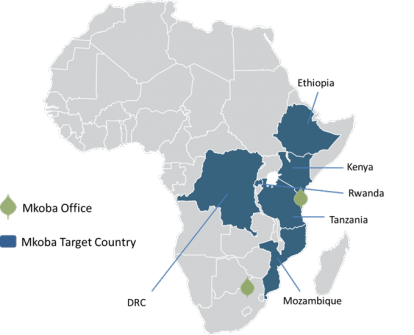 Having the right networks and on-the ground experience in doing business in these countries is enabling Mkoba to source proprietary deals before other “mainstream” PE funds. This ensures that Mkoba and its’ investors gain early mover advantage. These sectors have the greatest growth potential given the growing African middle class and increase in local consumer demand. This is especially true in the fast growing target countries selected by Mkoba. The focus sectors have huge development potential in terms of job creation, environmental benefits, broad based inclusive economic growth, technology adaptation and innovation, food security and social development. Opportunity to support the “missing middle”. Mkoba invests in African managed and/or owned businesses and joint ventures between local and international entrepreneurs. It seeks opportunity to support the “missing middle” by providing growth capital for high-growth small and medium sized companies. The fund also provides limited capital for innovative green-field companies. Hands-on active portfolio management and value creation strategy through Finance+. An integral part of Mkobas’ strategy is its hands-on approach to portfolio company management and post-investment value creation. In addition to providing capital through its’ equity investments Mkoba will work closely with its portfolio companies to unlock potential, strengthen performance and ensure that companies acquire the strategy, capacity, skills and know-how to grow, and expand into new markets. Mkoba’s proprietary Finance+ model means tailoring strategic and operational advice and assistance to the specific and unique needs of each portfolio company. Identifying these requirements forms part of the advanced pre-investment due diligence.